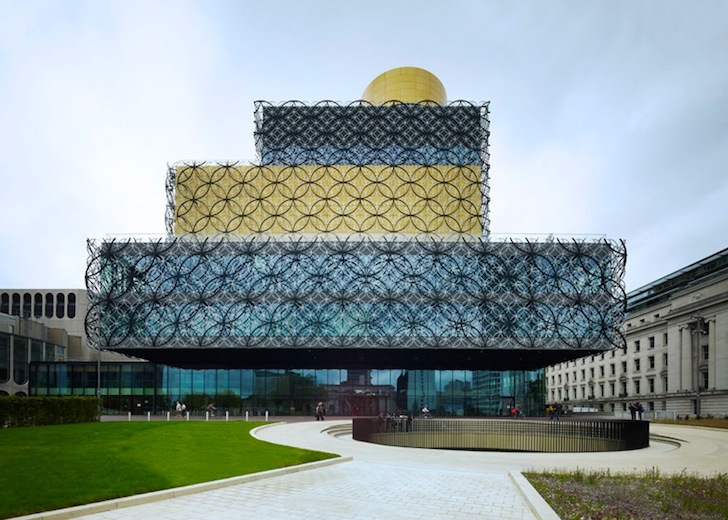 After five long years, the stunning £188.8 million Library of Birmingham will officially open its doors to the public on Tuesday, September 3, 2013. Designed by Dutch architects Mecanoo and engineering consultancy firm Buro Happold, Britain's largest public library replaces Birmingham’s Central Library with what is possibly the world's most luxurious-looking structure that features a sunken amphitheater, "secret" rooftop gardens, and a beautiful filigree veil of interlocking metal rings over a gold and silver glass skin. Located in the heart of the city, the Library of Birmingham’s eye-catching metal lattice was designed in reference to Birmingham’s “interlocking stories of industrial heritage, jewelry, people and knowledge.” The new modernized design is a sharp contrast with its predecessor’s Brutalist concrete form, swapping the old inverted ziggurat design with four staggered rectangular volumes held within a shimmering glass façade. Inside are ten floors: three of the main reading levels spiral out from a open rotunda, a focal point of the building; one floor is underground; the tenth is a rooftop rotunda housing the Shakespeare Memorial Room, designed in 1882. 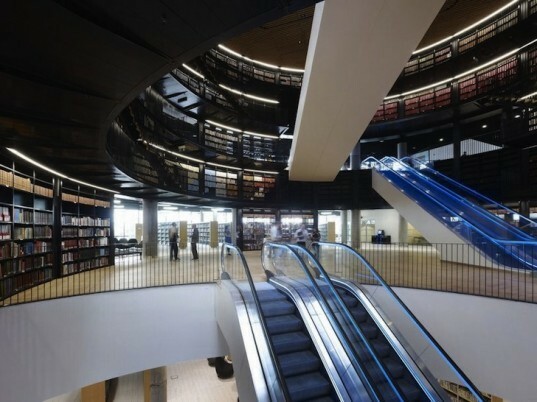 A modern reincarnation of its predecessor the Central Library, the 35,000 square-meter Library of Birmingham commands a 20% larger footprint but with a 50% less demand for energy. As a BREEAM ‘Excellent’ rated building, the library incorporates grey water systems and ground source heat pumps. Two outdoor garden terraces also attract biodiversity and help with carbon sequestration. The state-of-the-art library will be integrated with the existing Birmingham REP Theatre, and will share many new facilities, including a 300 seat auditorium, meeting and conference rooms, as well as a cafe and restaurant. Envisioned as the “social heart” of Birmingham, the new library will also offer 400,000 new books to an expected crowd of 3.5 million visitors a year. A labeled illustrative section of the library. Library of Birmingham's eye-catching metal lattice was designed in reference to Birmingham's "interlocking stories of industrial heritage, jewelry, people and knowledge." The two outdoor garden terraces also attract biodiversity and help with carbon sequestration. The state-of-the-art library will be integrated with the existing Birmingham REP Theatre. A circular motif runs through the entire design. The new modernized design is a sharp contrast with its predecessor’s Brutalist concrete form. The metal ring facade creates an interesting play of light and shadow. A new 300-seat auditorium is added to the library. Envisioned as the “social heart” of Birmingham, the new library will also offer 400,000 new books to an expected crowd of 3.5 million visitors a year.